Inflatable Chaise is the name of a lovely collaboration between two stalwarts of Toronto’s music community—Thom Gill and Ryan Driver. Thom and Ryan are visionary musicians, each possessed by a profound individual talent. Though their styles are highly distinct, this collaboration is complementary to them both. The instrumentation is rather sparse, with nylon-string and electric guitars, synthesizer, and flute taking up the most sonic space. Inflatable Chaise makes the most of this limited palette, though, creating rich and compelling textures that put flesh to the word. This release (can I call it an EP?) has four tracks—“FRUIT”, “DOVE”, “PUMP”, “CHILD”—united less by theme than by the spirit and sound of Thom and Ryan’s musical chemistry. “FRUIT”, also known as “Fruitless Endeavour”, for example, has been in Ryan’s catalogue for over five years, and has had many different lives across his history of live performance. Between the hands of Thom and Ryan, the song takes on a languid melancholy, pairing perfectly with the good-humoured resignation of the lyrics: “Ha ha! I’ll never last forever”. On the whole, this placid allure characterizes the EP. It’s a low-key affair. It was announced abruptly on facebook with a link to a bandcamp page. 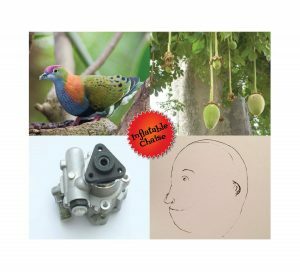 Follow the link, and you’ll find an album cover: a quadriptych of a fruit, a dove, a pump, and a child (get it?). You’re invited to pay whatever you want. This approach could strike some as lackadaisical. But to me, coming from musicians who’ve worked so prolifically and developed such prodigious ability, I suspect a deeper political, maybe even spiritual statement. Namely, that which is beautiful shouldn’t have to scream for attention. It can come unannounced and without fanfare. It can drift you by like a lovely spring day.